Opening hours: Shops are generally open from 9am-2pm and 5pm-9pm (later in summer). Main shops do not close during lunch time. It is possible to explore the city by foot, which is the best way to inhale the life in Granada, as the shadow of the Alhambra guards you. The pace of life here is different. Get used to long leisurely lunches, and decadent afternoon naps called siestas. 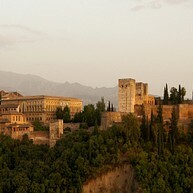 All of Granada sleeps during this time, so it is difficult to avoid becoming part of the life and routine here. This is one of the most obvious must-sees because the outline of its impressive structure dominates the city. This 9th-century castle is utterly magical and consists of a seemingly endless stretch of buildings and gardens. It is possible to visit the Alhambra at night, which is particularly impressive and definitely worth the effort. The Cathedral of Santa María De La Encarnación is Grenada’s most famous cavernous Renaissance and Gothic cathedral. There is a small museum adjacent to the church. Monestario De La Cartuja is an elaborate Baroque monastery and church which was constructed between the 16th and 18th centuries. The Sanctuary and Sacristy are particularly impressive. Within the brick walls you can enjoy breathtaking gardens and see how clerics and monks lived throughout the years. In an authentic ancient house you can try an Arabic style bath. The smells of scented oils waft through the air as you relax in the hot or cool pools, or enjoy a massage. There is a rooftop restaurant and teahouse onsite. Huerta De San Vicente is the house where famous writer Federico García Lorca spent summers and wrote some of his best known works. The house is located 15 minutes by foot from the city centre. The Albayzín is composed by snaking corridors and alleyways that make up the old Arabian quarter of Granada. It is a pleasure just to wander the warren of streets. Plaza Larga is a place with lively bars and tapas restaurants. A market is held every day until 2pm. Drop by for fruit, vegetables and a variety of clothing. The music stalls are also worth exploring. 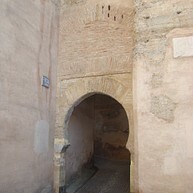 Arco De Las Pesas is located just off Plaza Larga, a striking Islamic gateway defensive wall. The archway is built with stone from the city of Malahá and was built in the eleventh century. Mirador De San Nicolás is a lookout point with stunning views of the Alhambra, the Sierra Nevada Mountains and all of Granada. 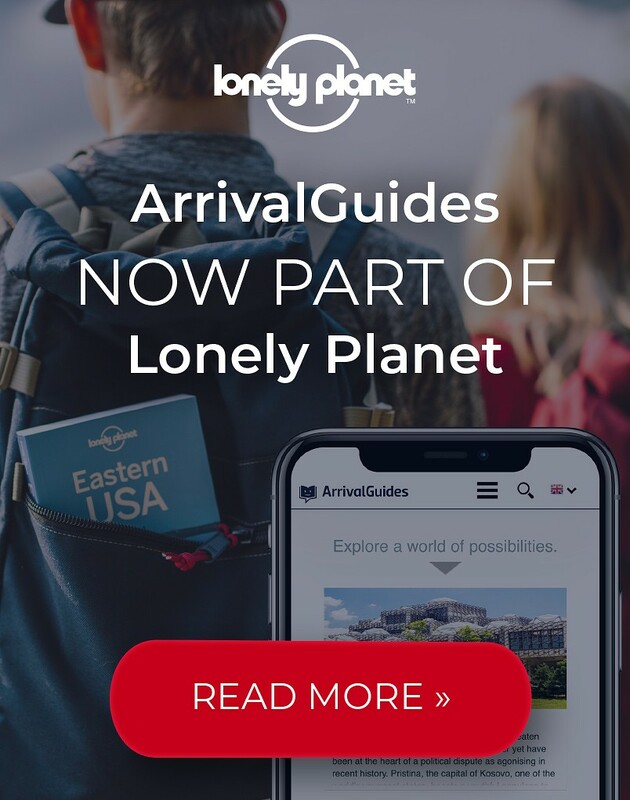 This is the perfect place to go and see one of the most beautiful sunsets. This mystic neighbourhood's name literally means "sacred mountain". The place was traditionally occupied by the Gitanos (historically Roman people, also called Gypsies). A series of roads winding up the mountain are flanked by caves that are literally carved out of the side of the mountain. They served as the original dwellings for this area's first inhabitants. Many of the caves are still used as houses; others have been converted to restaurants and bars. 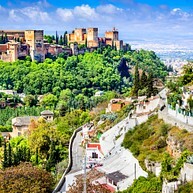 Nasrid Wall is the 16th city perimeter wall which snakes through the Sacromonte district. A walk along this wall will provide a thorough exploration of the Sacromonte, including beautiful views of the Alhambra and the Albayzin. 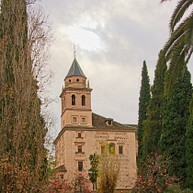 Overlooking the impressive Alhambra palace lies the lovely Generalife Garden. With its bright flowerbeds and picturesque fountains, its higher and lower gardens are the ideal spot for an evening stroll. 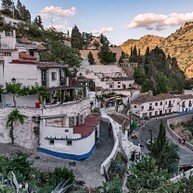 You don’t want to miss this Andalusian scenery with great architecture in a floral setting on your holiday pictures. After centuries of banishing Islam from the religious map, this Mosque was built in 2003 and is open to everyone. You can visit the building and also step into the main prayer halls by appointment. 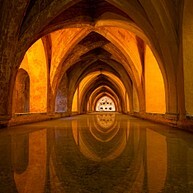 The mosque is also worth visiting for its outlook on the beautiful architecture of the Alhambra. Not far from Granada’s Cathedral visitors can find a traditional market. 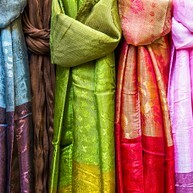 The former silk market was rebuilt in 19th century and has local jewellery and souvenirs on offer. 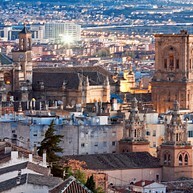 Take home a piece of Granada or drop by for the lovely sight of the Moorish architecture – it’s always worth a visit. This Basilica boasts with gold on the inside and gold on the outside. 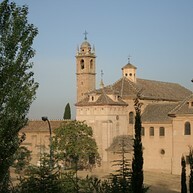 Within you can discover treasures of the past and visit the final resting place of important Spanish clerics. Take a tour with one of the friendly guides and learn about the history and background of this place of worship. 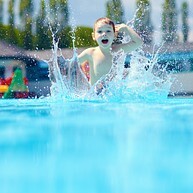 If you’re looking for some refreshing fun during your holidays, this is the place for you. The water park offers entertainment and relaxation for the whole family with wave pools, slides and quiet spots to soak up the Spanish sun.